Like most of the Italian peninsula in the nineteenth century, the Umbrian city of Spoleto was actively involved in the Risorgimento, the political and cultural movement for Italian unification. Inspired by the progressive ideals of the eighteenth century and the romantic nationalism of the 1820s and 1830s, the people took to the streets in 1848 to proclaim Italy a unified nation, no longer separated into small dominions based on historically defined boundaries. It was into this environment that Cesare Augusto Detti was born to Annunziata Vannini and Davide Detti on November 28, 1847, scarcely more than a month before the first of the revolutionary actions began. Against the backdrop of this populist political struggle, Detti enjoyed a comfortable childhood with parents who encouraged his interest in art. His father, although an engineer by training and practice, was also an amateur painter; he may have been instrumental in introducing his teenage son to Francesco Coghetti, a visiting artist from Rome who was working on designs at the Spoleto Teatro Nuovo (New Theatre) in 1861. Coghetti was also a professor at the Accademia di San Luca in Rome, and probably suggested that the young Detti consider pursuing his art education there. In 1862, at age fifteen, he did exactly that. By the time that Detti arrived in Rome, Italy had finally achieved its hard-won unification; only two regions, Venice and Rome, remained under control of other governments, (the Austrian Empire in Venice and the Pope in Rome) but both cities would be independent by 1866 and 1870 respectively. Detti studied at the Accademia for four years, graduating from the program in 1866 and embarking on his career at a time when fresh aesthetic ideas were an integral element in the newly-formed nation. Detti’s years at the Accademia brought him into contact with a wide variety of artists, both fellow students and more well established figures such as the Catalan painter Mariano Fortuny y Marsal (1838-1874), who welcomed the young painter into the Spanish art colony in the city. By the 1860s when Detti met him, Fortuny’s career was increasingly international and somewhat experimental. He had traveled extensively in North Africa and France, and perhaps more significantly, had spent time in Florence where the avant-garde painters known as the Macchiaioli were introducing aesthetic concepts similar to those of the Impressionists in Paris. In 1866 Fortuny broadened his scope beyond Italy and Spain when he signed a contract with the Paris art dealer, Adolphe Goupil (1806-1893), a decision that would also prove to be instrumental in Detti’s career a decade later. After graduation in 1866, Detti followed Fortuny’s example in traveling extensively to absorb new landscapes, new cities and new ideas. He spent considerable time in Naples in the late 1860s, and was included in an exhibition there in 1872. It was most likely during these years that he was introduced to the work of the engraver and illustrator, Bartolomeo Pinelli (1771-1835), in particular to his Costumes of the Kingdom of Naples, a series of 50 copperplate engravings published in 1828. In these images, Pinelli illustrated both costumes and customs in great detail; typically his carefully delineated figures dominate the engravings so that an attentive viewer can fully appreciate the intricacies of the clothing. As Detti defined his own aesthetic direction during the 1860s and 70s, he focused more and more on costumed genre painting that clearly owes a debt to Pinelli’s engravings as well as Fortuny’s meticulous realism. During the early 1870s Detti continued to base his career in Rome, but in 1876, he visited Paris, and it was at that point that he met Adolphe Goupil, one of the leading art dealers in Paris. Soon after that meeting, Detti’s paintings were on display in the gallery on the Boulevard Montmartre and they were also being transformed into engravings that Goupil could market to a middle-class audience. Detti’s association with Goupil introduced him to yet another group of artists, including Giuseppe De NIttis (1846-1884) and Ignacio de Leon y Escosura (1834-1901), both of whom were also represented by Goupil & Cie. Like Detti, their contracts called for them to paint a variety of genre scenes that would appeal to bourgeois art lovers who preferred images on a scale that would fit into their homes. This type of painting was inspired in part by eighteenth century rococo paintings of both rural and urban daily life; however, nineteenth century artists such as Detti incorporated new elements reflecting the Realist movement of the 1850s and 60s in both subject matter and style. 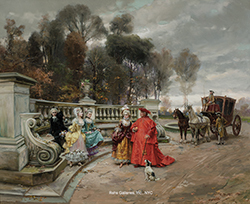 A painting such as Flowers for Her Ladyship depict a cavalier presenting a bouquet to an elaborated gowned woman, but the setting for this encounter looks more like an overwrought rococo revival room than an elegant eighteenth century interior; and that sense of humor is part of the appeal. In a more modern mode, Detti also painted works such as Varnishing Day, a painting that shows contemporary Parisians witnessing the final varnishing of oil paintings just days before the opening of the annual Salon. Canvases like this give the viewer a glimpse of real life in the late 1870s very much in the naturalist style of forward-looking artists throughout Europe. Detti seems to have settled comfortably into life in Paris. 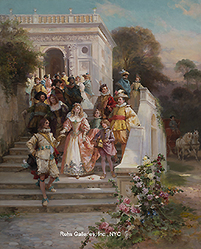 He exhibited at the Salon des Artistes Français beginning in 1877, showing La Cinquantaini (Golden Wedding Anniversary) that year, and in 1878 exhibiting La Rixe (The Brawl) at the Exposition Universelle. In addition, his work came to the attention of William Henry Vanderbilt, the American railroad tycoon, who purchased a number of Detti’s paintings directly from the artist. It was probably his meeting with Juliette-Emilie Filieuse, however, that persuaded Detti to remain in France permanently. He had met Mlle Filieuse through her brother Augustine, and married her in 1880. In quick succession over the next few years, they had two daughters and a son, and in 1883, the family moved to the village of Marlotte outside of Paris. The decade of the 1880s was one of expansion in Detti’s career. He undertook at least two book illustration projects for the publishing firm of Firmin. The first was the 1886 edition of Sir Walter Scott’s The Abbot (published as L’Abbé in French) first published in 1820; and the second was an 1888 edition of Scott’s The Fair Maid of Perth (La Jolie Fille de Perth) which was originally published in 1828. With his skill at depicting costume pieces from historical eras, it is not surprising that Detti would have been asked to design illustrations for these romantic English novels. Detti’s connection with England also took the form of participation in the Italian Exhibition in London in 1888. This exhibition was a smaller version of the mammoth world fairs that had mesmerized the public since 1851. It was developed by a group of English businessmen and, like the world fairs, was intended to be a showcase for modern industrial designs and cultural displays. In this case, the sponsors held four national exhibitions in London from 1887 to 1891 (American, Italian, French and German respectively). [i] Detti’s participation in this exhibition may have been encouraged by his friend Ignacio de Leon y Escosura, who seems to have been actively involved in several other international exhibitions, including the Exposition Universelle in London(1874) and Berlin, (1886); he would later be the artistic delegate for Spain at the Worlds’ Columbian Exposition in Chicago in 1893. 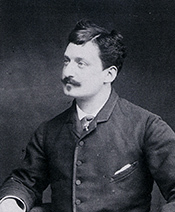 Detti himself was appointed as vice-president of the Italian committee for the spectacular Paris fair in 1889 at which the Eiffel Tower made its debut; that year he also won a bronze medal for painting. At the next grand Exposition universelle in Paris (1900), Detti would win a silver medal for his painting of La Tricheur (The Cheat). The first decade of the twentieth century was one of travel, with trips to Buenos Aires and a tour through the United States between 1906 and 1910. On returning to Europe, Detti journeyed through Spain and Italy, painting his favorite locales and undoubtedly seeing old friends as much as possible. WIth the outbreak of World War I, the government of France required that most non-French residents return to their home countries, and since it is not yet known whether Detti became a French citizen, it is possible that he had no choice but to return to Italy during the war. In any case, he was working in Rome in 1914 when he received a call that his son was seriously ill; he returned immediately to France to take care of his responsibilities there. Unfortunately, he himself died on May 19, 1914 and is buried in the family plot in Marlotte. [i] For a first hand account, including primary documentation, see Charles Lowe, Four national exhibitions in London and their organiser With portraits and illustrations, (London: T. F. Unwin, 1892). [ii] Cesare Augusto Detti (1847-1914), Il talento per il successo, ed. Giovanna Sapori, ex. cat. Rocca Albornoziana, (Milan: Mondadori Electa S. p. A. Milano, 2003) 19.